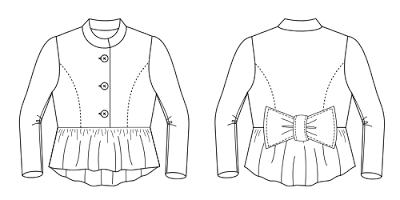 the Jocole blog: Pattern Testers Wanted -- No-Name Coat -- CLOSED !!! Pattern Testers Wanted -- No-Name Coat -- CLOSED !!! THIS TESTING IS NOW CLOSED !!! I'm currently looking for people who are interesting in testing my "No-Name COAT" (#25003) sewing pattern before making it available for purchase. IMPORTANT: I *need* the reviews back by January 13th!! Description: A super cute cropped coat featuring an empire waist with a button-up front, a ruffle that is longer in the back, topped with a super cute bow. **I reserve the right to choose whomever I wish to test. It will not be based on a first-come first-serve basis. If you've tested before and did not return the results you are NOT eligible.... and you must have purchased pattern from Jocole before. Or 3T I can test either. I just realized I'm not eligible, as I haven't purchased your patterns before! So I withdraw, and I'll try this pattern when it is released. I have some stashed red pinwale that would look great in this style. Would love to test it! I have some nice fabrics on hand. I can do size 12m for my baby princess or size 8 for my big princess. I can do a 3T... but wow... looks like you've got some takers already! Way to go Jodi. I can test 5, 7, 12. tjarman@adelphia.net I have experience testing for pattern makers! And I'm rather handy with the camera!!! I can test the 3T or 5 or 6. I would love to test a sz7 or 8!